Bold and clever, THE CAVANAUGHS are unlike any other family in early Victorian England. 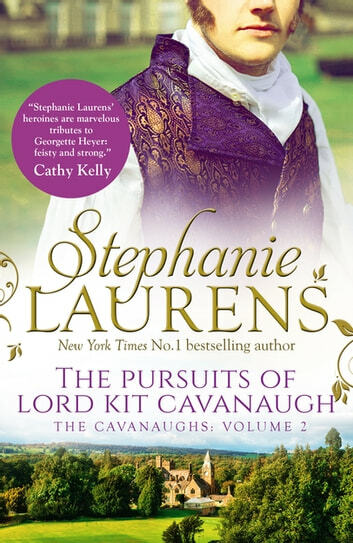 No.1 New York Times bestselling author Stephanie Laurens continues to explore the enthralling world of these dynamic siblings in the eagerly anticipated second volume in her captivating series. One of the most eligible bachelors in London, Lord Christopher ‘Kit’ Cavanaugh has discovered his true path and it doesn't include the expected society marriage. Kit is all business and has chosen the bustling port of Bristol to launch his passion - Cavanaugh Yachts. Miss Sylvia Buckleberry's passion is her school for impoverished children. When a new business venture forces the school out of its building, she must act quickly. But confronting Kit Cavanaugh is a daunting task made even more difficult by their first and only previous meeting, when, believing she'd never see him again, she'd treated him dismissively. Still, Sylvia is determined to be persuasive. But it quickly becomes clear there are others who want the school - and Cavanaugh Yachts - closed. Working side by side, Kit and Sylvia fight to secure her school and to expose the blackguard trying to sabotage his business. Yet an even more dastardly villain lurks, one who threatens the future both discover they now hold dear. Once again I have really enjoyed a Stephanie Laurens book, The Pursuits of Lord Kit Cavanaugh. I have been a fan for years and eagerly await the next book to arrive. I like the style of the writing and would recommend the authors books to anyone who loves a good family saga, and this one in particular.